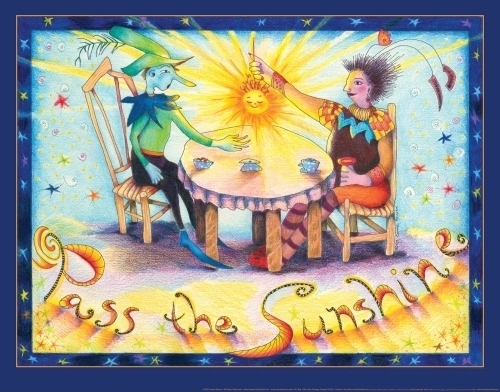 Click here to order the "Pass the Sunshine" poster, You will be directed to my cafepress website. Cafepress will print and ship this 22"x28" poster directly to you. There is a white border around the artwork which can be left on or trimmed off, whichever you prefer. I am thrilled to be offering this positive, inspirational poster for sale. The price is $22.99 plus shipping. It is printed on heavyweight 7 mil semi-gloss paper using superior dye inks. Your poster will arrive in a mailing tube, ready to hang as is, or to pop into a ready-made poster frame from your local Michaels or other craft store. whimsical fantasy to bring a smile to your home, office or classroom. Notice how the figure on the right is painted in warm colors, while the figure on the left is painted in cool colors. As we "Pass the Sunshine" from one to another, we are spreading beauty, harmony, order and light in all that we do!